1Add the text for your list in Notepad. 8 to 12 years old. 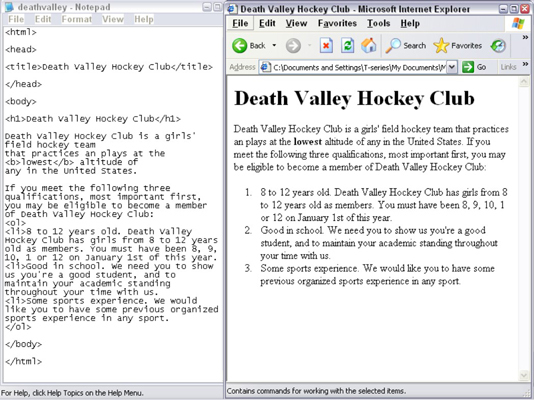 Death Valley Hockey Club has girls from 8 to 12 years old as members. You must have been 8, 9, 10, 11 or 12 on January 1st of this year. Good in school. We need you to show us you’re a good student, and to maintain your academic standing throughout your time with us. Some sports experience. We would like you to have some previous organized sports experience in any sport. 2Surround the lines that will make up the list with the list tags, <ul> and </ul> for an unordered (bulleted) list, or <ol> and </ol> for an ordered (numbered) list. In the example, the <ol> tag went before the line that begins 8 to 12 years old, and the </ol> tag after the period following the words in any sport. 3Precede each list item with the <li> tag. With new standards such as XML and XHTML in place, it’s considered good form to always close off tags, which means that it’s now recommended that you use a closing </li> tag after each item. This is good advice, yet there’s never enough time to do all one would like to do, and this recommendation may fall into that category. 4(Optional) for a bulleted list, change the bullet style by adding an additional element, called an attribute, to each <li> tag. 5Save your document adding .htm to the filename, if you’re saving it for the first time, and open it in a Web browser window (or refresh the window if you already have this document open). The list appears in the edited Web page.